Hastings United Football Club will pit its wits against Brighton & Hove Albion’s under-23 development squad tonight (Tuesday). The teams will meet in a Sussex Senior Challenge Cup third round tie at The Pilot Field which will kick-off at 7.45pm. 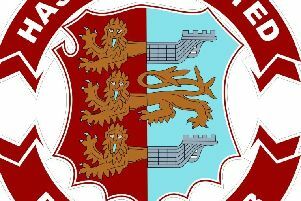 Hastings lie second in the Bostik League South East Division, albeit having lost all of their last three games, including a 2-1 defeat at Haywards Heath Town on Saturday. Chris Agutter’s team will be eager to regain some form against a Brighton side which won the Sussex Senior Challenge Cup last season. Hastings came from 2-0 down to win 4-2 away to Saltdean United in the previous round, while Brighton were 1-0 winners away to Bostik League Premier Division outfit Lewes. The winners tonight will join the likes of Haywards Heath Town, East Grinstead Town, East Preston, Bognor Regis Town and Eastbourne Borough in the quarter-finals. The Sussex Senior Challenge Cup - the last knockout competition Hastings are still involved in this term - is the longest running cup competition in the county having first been played for in the 1882/83 season, shortly after the founding of the Sussex County FA.